Voting rights emerged as the top response when asked what people would consider the power of turning 18 years old, according to a new survey from Twitter India. With this empowering insight, Twitter is launching today a social initiative called #PowerOf18 aimed at encouraging the youth of India to contribute to public debate and participate in civic engagement in the upcoming election season. 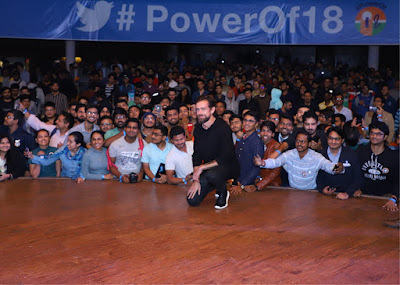 Supported by Twitter’s mission to serve the public conversation, the initiative was launched by Jack Dorsey, CEO & Co-Founder, Twitter and Maya Hari, Vice-President & Managing Director, Asia Pacific, Twitter in a Townhall chat with the students of IIT Delhi today. The campaign launch is marked by an emoji activated by the #PowerOf18 hashtag. In relation, Twitter India aims to encourage the youth of India with #PowerOf18 to leverage the platform for public conversation and vote for the future they seek. As part of the initiative, Twitter is kickstarting the initiative with an online video series on @TwitterIndia featuring young personalities across India such as Indian singer Jassie Gill (@JassieGill), Indian boxer Nikhat Zareen (@Nikhat_Zareen), writer, poet and #MeTooIndia voice Mahima Kukreja (@AGirlOfHerWords), sharing about their inspirations and their view of #PowerOf18. Twitter seeks to work with more like-minded partners and personalities to create awareness of the importance of voting.